This extension has several purposes. The first is to get rid of the close buttons on all tabs. The second is to make the tab width more flexible; instead of a fixed width they will scale, so that there will first be overflow with many tabs open. The third is to make a close button available as a toolbar button. Start finding text on a page by typing. 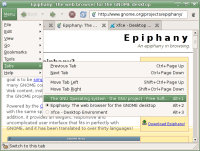 This extension requires Epiphany 2.16 or later, or alternatively Epiphany 2.14 with the patch found in Epiphany bug #345837 (direct link to patch). Start finding links on a page by typing. Don't enable this extension when you have the "Automatic Find As You Type" extension enabled. Set URGENT window manager hint when content changes in a window that doesn't have focus. Put the content of the menubar into a single compact menu. Move the spinner (also known as "throbber") to the menubar. Confirm closing of windows with multiple tabs. This extension is too buggy and have as such been removed. See Epiphany bugs #355519 and #351709 for more information. Close tabs by clicking on them with the middle mouse button. Also disables switching between tabs by scrolling over the tab bar with a mouse scroll wheel. 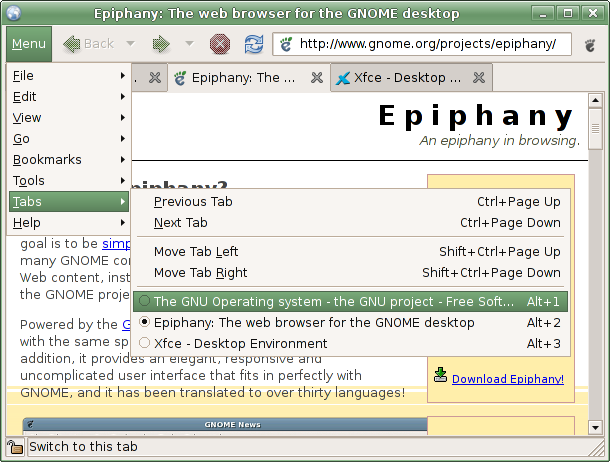 Known issue: This extension doesn't support middle click close with Epiphany 2.20 and/or GTK+ 2.12. * Works better with new extension, "Middle Click Tab Close"
A simpler way to choose which tab to focus after closing another. The default in Epiphany is to fucus the last focused tab. With this extension, it will focus the tab to the right of the closed tab (if any; if not, it will focus the tab to the left). Another simpler way to choose which tab to focus after closing another. The default in Epiphany is to fucus the last focused tab. With this extension, it will focus the tab to the left of the closed tab (if any; if not, it will focus the tab to the right). This extension is almost the same as the Simple Tab Close Focus extension, except that its behaviour is reversed. Less border around tab labels. Sets the border to 1 pixel. Put the menubar and toolbar beside each other. There are some issues with customizing toolbars while in this mode; deactivate this extension when you want to do that. Use the tab key (Ctrl+Tab and Ctrl+Shift+Tab) to navigate between tabs. They do not work with newer Webkit based versions of Epiphany.